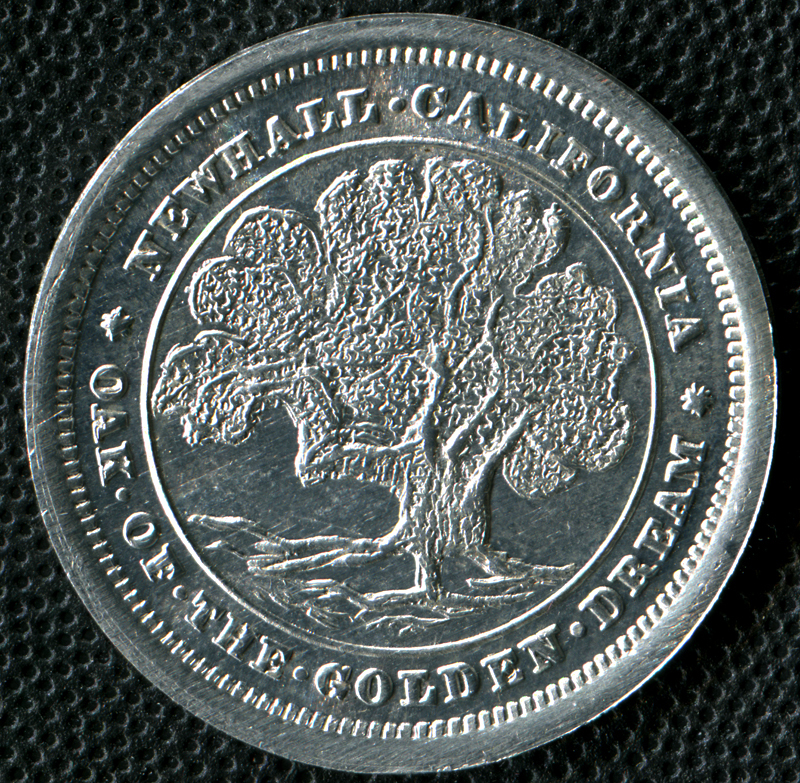 1968 uniface aluminum Anillo restrike of 1948 Placerita Canyon Oak of the Golden Dream medal. This is one instance where the copy is scarcer than the original. The original medals were struck to order by the Los Angeles Rubber Stamp Co., aka Los Angeles Stamp & Stationery Co., whose history dated to the 1880s. In 1968, when Los Angeles Stamp & Stationery went out of business, Anillo Industries of Orange, Calif., purchased its inventory, including 3,492 original dies used in the manufacture of trade tokens and medals, mostly of California issue. Anillo intended to go into the token and medal business. It reportedly struck 25 sets of uniface (one-side-only) tokens and medals from the 3,492 dies, in aluminum, to be mounted in salesmen's sample books. Only four books were made up, and it's likely that only four examples of each token and medal were actually struck. Known Anillo restrikes of Newhall/Santa Clarita interest include the 1948 Placerita Gold Discovery medal; the 1949-51 Placeritos Ranch (Fourth of July) trade tokens; and the 1952-53 Newhall Old West Association (Fourth of July) trade tokens. All of the originals were struck in quantities of hundreds or thousands and all are quite common today (although 50¢ denominations of both Placeritos and Newhall Old West are less so). Just four each of the Anillo restrikes were ever issued, and it's unknown how many of the four still survive. This is one of the four Anillo restrike "Oak of the Golden Dream" medals. LW2338: 9600 dpi jpeg from scan of medal, acquired 2013 from exonumia dealer Richard D. Mitchell of Oklahoma City (RDMOC Coins).